It has almost been 2 years since the last episode of Radio Causeway, so answering the call to fill in for DJ Darla Bea’s ROCK IT PROPERLY on KCSB-FM in Santa Barbara meant coming in with something fierce. Luckily, I was able to get in touch with psychedelic rock & roller, guitar virtuoso, and friend Isaiah “The Curve” Mitchell and he has joined me for chat about his various projects. 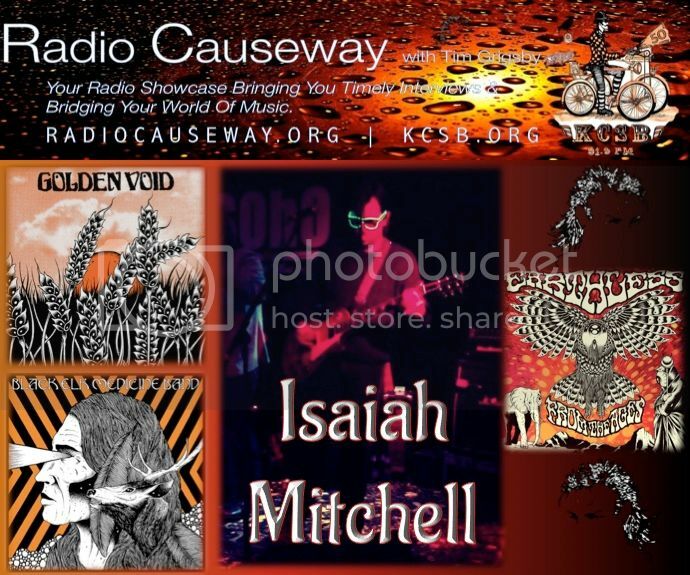 Isaiah plays in many bands including Earthless, Golden Void, Black Elk Medicine Band, Shock & Awe and more. He has also toured with the likes of Nebula, Candye Kane, Lady Dottie and the Diamonds, and Drunk Horse. We speak about the October release of the Earthless album From The Ages, Golden Void releases and tour, the launch of his multifaceted website, as well as how to survive a tour 101. Plus, the Mullet’s Strange News and Yeah! Free Music! The Yeah! Free Music! pick of the week is from the Indonesian electro-experimental pop group, Bottlesmoker featuring their song, Free Hugs, which is off the 2013 double LP titled Hypnagogic. Golden Void - The Curve from Thrill Jockey Records on Vimeo. Golden Void - Atlantis from Dworppilatus on Vimeo. Listen live Sunday August 25 at 9pm pt on KCSB-FM 91.9 in Santa Barbara or streaming at KCSB.ORG.